Smart Communications now release their Samsung Galaxy S7 postpaid plan price which only cost you 1999 pesos monthly. 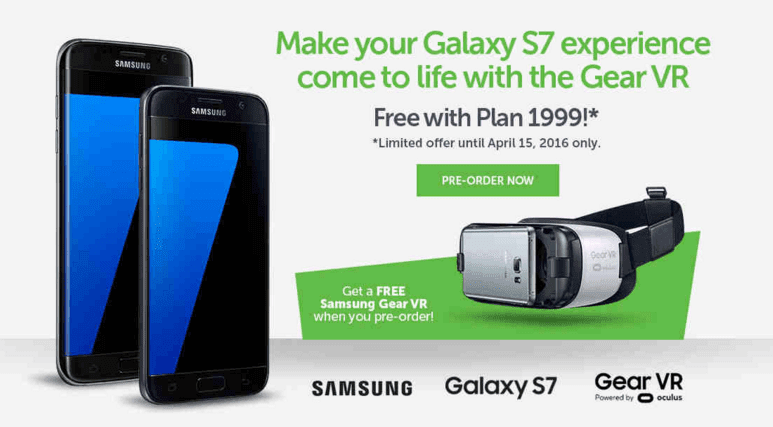 You can also get free Samsung Gear VR when you pre- order this limited offer until April 15, 2016 only. Both gadgets can be yours when you apply for Smart Surf Plus plan 1999 via online store or you can go to the nearest Smart stores where this promo is available. For NCR/ Manila area you can proceed to SM Megamall, North EDSA, Power Plant Mall, SM Mall of Asia (MOA). To those who live in Cebu, just go to SM Cebu, for Davao and Mindanao nearby areas visit SM Davao and lastly for Pangasinan you can apply to their Smart store at SM Rosales. For Samsung Galaxy S7 Edge, you'll need to pay for cash out amounting to 4,800 pesos. If you’re planning to get S7 and VR with Smart Postpaid make sure to apply it on the said promo period to enjoy those freebies with no cash out needed. For those who prefer prepaid you’ll have the to go to your nearest Samsung stores but if you want to go online anytime you can go with postpaid network plan with free calls and texts service added.